The family fantasy/adventure will make Blu-ray extra blue in December. In an early announcement to retailers, Sony will be bringing 'The Smurfs' starring Neil Patrick Harris and Hank Azaria (as Gargamel) to high-definition in a Blu-ray/DVD/Ultraviolet Copy Holiday Gift Set on December 2. 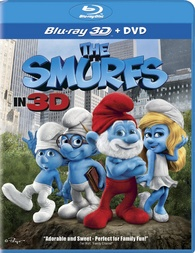 'The Smurfs - 3D' (2D and DVD included) will also be available on the same date. The critically panned film combines live-action with CGI animation by sending the little blue people to the Big Apple... which has NOTHING TO DO WITH THE SMURFS. Sorry, that just slipped out. The Blu-rays will feature 1080p video, a DTS-HD Master Audio 5.1 soundtrack, and supplements include: "Find the Smurfs" Game; The Smurfs: A Christmas Carol Mini-movie; Smurf-O-Vision: Second Screen Experience; "The Smurfs Fantastic Adventure" Game; Director's Commentary; Producer, Writers and VFX Supervisor Commentary; Deleted & Extended Scenes; The Smurfs: Comic Book to the Big Screen featurette; Smurf Speak: Meet the Cast featurette; Going Gargamel featurette; Progression Reels; "Happy Music" Montage; and Blue-pers. Suggested list price for the Blu-ray is $35.99 and $40.99 for the Blu-ray 3D. You can find the latest specs for 'The Smurfs' and 'The Smurfs - 3D' linked from our Blu-ray Release Schedule, where they're indexed under December 2.